Laughing gulls are named for the sound of their call, a very distinctive “ha-ha-ha-ha.” They are found primarily on the Atlantic and Gulf coasts of the United States. They are very noisy and quarrelsome birds, and they are known for stealing food from other birds and each other. They feed primarily on fish and small marine animals, but they are very adaptive and will eat almost anything. Conservation Status: Although their numbers are not at risk currently, some nesting areas on beaches are disturbed by human activity. 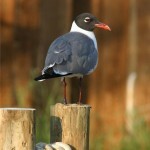 The Cameron Park Zoo’s Laughing Gulls are all birds that were injured in the wild and are non-releasable. Over the last few years, they have grown so comfortable in their new home that they have started breeding. The offspring from the non-releasable birds are taken back to the coast and released into the wild.